But we do not love tedious tasks, like invoicing and accounting. This was solved by Translation Office 3000 a long time ago. So, our scouts continued to search for routine tasks to automate in the translator’s workflow. And they found the task of proofreading! Not proofreading by a second person, which is a must in the professional workflow. But catching all the small mistakes, which can slip passed your eyes on a sleepless translation night before the deadline. With love for translation profession, we developed AceProof to help you identify errors and make your work a piece of translation art. 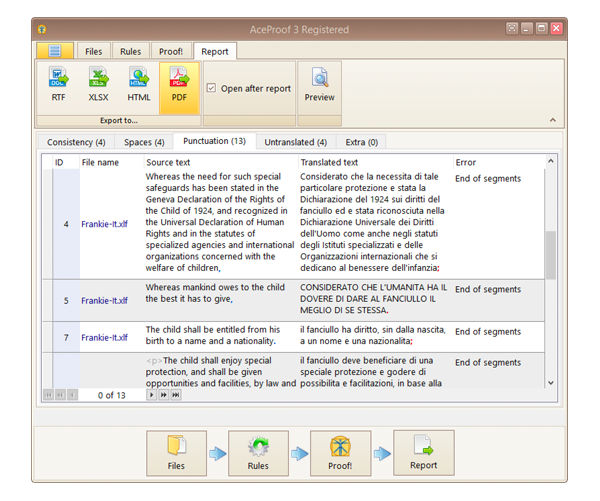 AceProof: Nice and Simple Translation Quality Assurance Software is ready for download! AceProof will strengthen your toolbox of a successful translator. 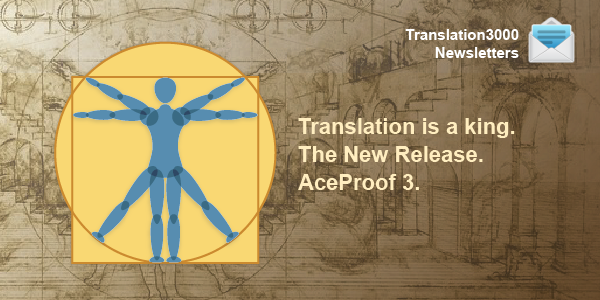 AceProof helps you to analyze translated documents for possible errors, which a human reviewer can overlook. No more misprints, redundant or missing spaces, punctuation marks, tags, mismatches, or capitalization errors. Let your translations be perfectly correct. Kill all errors! Check out the new AceProof – try it for free. With translation services, the accuracy of a translator’s work is crucial. Returning a copy with mistakes is just like crossing a street blindfolded. You may make be lucky, but nothing should be left to chance. Clients rely on translations when they go to court, read technical documents, close a business deal, or launch a new business abroad. Any mistake could cause a lot of trouble and have unpleasant consequences. But you know this all too well. So how can you prevent errors? Use an automated translation quality checker! to survive. Get AceProof at 55% off. new automated error checks to AceProof. Join the error-free professional translation club!